Bead Bai: Early Asian African dukas in East Africa. Bead Bai is the story of the woman behind the store front. In towns and remote rural areas, women raised families and also managed stores. They came as teenage or child brides and died as grandmothers here. A woman's dowry ornaments often provided security for businesses and sometimes even capital for expansion or restart after collapse. Bead Shop, Embu, Kenya 1930s. Bharat Patel identified this store as that of his grandfather Gordhan Bhai Javer Bhai Patel. The home was often behind and attached to the duka. Notice the beads on right. Each ethnic region had a completely different scheme of beads that patterned body ornaments. Kenya alone has forty ethnic groups. Hence the trade in beads in the first half of the last century was huge. The Bead Bais worked on tribal beads in their family stores in the most remote places in Africa at the equator. Small town rural duka. Notice sweets in jars in front (2 for tongolo, 1 for dhururu)). Often the Bais cooked sweets like simsim balls for these window jars. They would also arrange and display strings of beads. Notice some strings of beads hanging at the back in this small rural duka. Hi Atula: How nice to read your email. In 1920s my mother's family lived in Jugu Bazaar where my grandfather sold dried fish. In my childhood I used to come to the Bazaar with my aunts and mother. There was a shop there called Atul's - famous for threads and buttons. Rajan Lajli's bead shop was on the opposite side. Would you know of other bead families? I will certainly visit your shop when I am in Nairobi. Thank you for the invitation. I live in Vancouver now. If you are around this part of the world, please contact me so we can meet for coffee at least. best regards, Sultan Somjee on Who were these Bead Bais of East Africa who came to Canada as grandmothers? Hi Sultan, I just got the link to the post today. Well Juggu bazaar as it was known in those days is now known as Njugu lane. Around the 60's, 70's, 80's till up to 2000, the shops in the lane were owned by Indian gujarati traders, all wholesale shops dealing in textile fabrics. Well that has changed just one shop now dealing in textile fabrics, some have been turned into stores, few restaurants, a Cocacola distributor, few shops selling various items. We are family owned business still in Njugu lane for the past 50years, my grandfather & father retired some years ago. We are using the shop as an office. We had been talking of moving to Westlands area, however the charm of being in the CBD & in the lane is not anywhere else. You are most wellcome to visit us on Njugu lane. Atula Shah on Who were these Bead Bais of East Africa who came to Canada as grandmothers? To all you people, nice work (from Dev) on Early Asian African dukas in East Africa. Bead Bai is the story of the woman behind the store front. Hello Hussain: Yes there were Bead Bais across the mainland in EA. Many of the Bead Bais were Khojah women. The men collected their bead stock from Nairobi's Moti Bazaar also called Khojah bazaar that was the street behind the main jamat khana on Government Road. The book keeps on getting delayed. Now I estimate the publication in Summer this year. My apologies to the readers once again. Soon I will be posting the cover design that took a while mainly because of my changing thoughts about this multi-layered story of the Satpanth Khojah Bai on the savannah. Sultan Somjee on Who were these Bead Bais of East Africa who came to Canada as grandmothers? Never knew we had Bead Bais among us. It must have been a big trade and a nice vocation for some of us. I was born in and grew up in Zanzibar. Never seen this kind of occupation undertaken by our khoja ladies there. Do you have a definite date when this book will be up for sale to the public. Anyways thanks for the intro to this segment of our khoja involvement in the East African commerce. Hussain NY on Who were these Bead Bais of East Africa who came to Canada as grandmothers? Hello VC: The book is in the stage of cover design and then it will go to print. I would say Bead Bai will be out in two/three months. You could purchase directly from Amazon. I will be posting the details on the Blog http://thebeadbai.blogspot.com/ From early 1900s, it was the Kutchi/Kathiwari (Saurastrians, as my grandmother used to say) who carried the bead trade across Africa at the equator. Beads are singularly the most important art material of many tribal societies. My book, a historical fiction, is about African beads and a Gujarati rural family in Maasailand. Based on true characters and events, though a work of fiction. Thanks for writing, Sultan Somjee on Who were these Bead Bais of East Africa who came to Canada as grandmothers? When your book is out ..about bead bias of e africa..!! Many thanks. Would be very interested to read your account of our e african Kathiawar/kutch lot's history ..! Cheers, V C on Who were these Bead Bais of East Africa who came to Canada as grandmothers? Yes, I agree 'Hats off to our grandmothers and great grandmothers. This could be the story of your and many a grandmother and great grandmother not spoken of in history. They were a part of development of commerce in East Africa besides raising families in the remote corners of the tropics. My interest is in the Bais who carried the most important African aesthetic material i.e. beads. Hence, I have been researching on stories of Bead Bais. Many Asian African families sold beads as they established stores inland. Bead Bai is a story of one woman but is based on stories of many grandmothers and great grandmothers who lived at the time. Thanks for remembering the mothers who nurtured at least two generations in East Africa and who as you say `persevered in a men's world` . Sultan on Early Asian African dukas in East Africa. Bead Bai is the story of the woman behind the store front. Hats off to our grandmothers and great grandmothers . Thjs could easily be a story of my grandmother ,who a widow at 25 with children, persevered in a men's world and did very well. Thanks on Early Asian African dukas in East Africa. Bead Bai is the story of the woman behind the store front. I found your contribution very interesting and illuminating. I liked that display "Khota Moti Na Sacha Vepari" From the late 1930's my father operated a tailoring shop for ladies garments on Khimji Road off River Road - about a kilometer away from the Khoja Mosque. He had a very large Khoja/Ismaili clientele who came to him specifically on Khusali for their typical long dresses to be tailored by him. The shop name was Naranbhai Nagarbhai Tailor and Sons. He closed the shop in 1962. He passed away in Nairobi in 1991. Maybe you or your parents or some relation have memories of my father. Kind regards Kantilal on Who were these Bead Bais of East Africa who came to Canada as grandmothers? Yes there is a vacuum when it comes to how much we know about our pioneer ancestors, especially women pioneer ancestors. Sultan Somjee on Who were these Bead Bais of East Africa who came to Canada as grandmothers? Imagine a little storefront like that to sustain part of the family income in the African hinterland! It makes one reflect on our journey and the strength and sense of adventure of our ancestor pioneers. I remember echos and the words Juggu Bazar being uttered in my household when I was just a little boy. Thank you for writing this untold history, so neglected from textbooks. on Who were these Bead Bais of East Africa who came to Canada as grandmothers? Bead Bai will be released in Spring 2012. Meanwhile it would be nice to share memories of Bead Bais in all your families. A photograph of the Bead Bai or your bead duka in East Africa would be great. Though my experience has been among Satpanth Khojah, there were also Bead Bais among other communties. Hope they can also write and expand our knowledge of our shared Asian African history. More importantly we will have the names and memories of the Bead Bais recorded for posterity. What is not said in history is that the Bead Bais' industrious work helped the transport of Africa's most important art and aesthetic material i.e. the beads. Sultan Somjee on Who were these Bead Bais of East Africa who came to Canada as grandmothers? I am looking forward to your published book, please keep us updated on Who were these Bead Bais of East Africa who came to Canada as grandmothers? Dear Mr. Somjee Sultan, that is my father's shop. His full name is Gordhanbhai Javerbhai Patel, would like to know more about the photograph and if my father was known to the Photographer. Seeing this meant a lot to us. all family members on Early Asian African dukas in East Africa. Bead Bai is the story of the woman behind the store front. Bharat: What was your grandfather's name and the name of the store. I can add below for memory's sake. Thanks Sultan on Early Asian African dukas in East Africa. Bead Bai is the story of the woman behind the store front. Thats my grandfather's store!! Made our day when we came across it,,thanks Bharat K Patel on Early Asian African dukas in East Africa. Bead Bai is the story of the woman behind the store front. I am the 4th generation of my family who were born in Africa and my children the 5th,The first generation was born in 1890 in Dar es Salaam.I have never been to India but this story moved my inner roots.I have heard from my parents and grandparents same story of famine and comming to Africa and never going back. I only know that we came from Kucth Mandvi. Dear Sultan, Excellent writing. Very good read. I thank you for sending me the link and look forward to its publication. I look forward to you coming to monthly storytelling to inform of your book and your stories. May is the last event of this season and we start again in September. What was your grandfather's name and the name of the store. I can add below for memory's sake. Yes, I agree 'Hats off to our grandmothers and great grandmothers. This could be the story of your and many a grandmother and great grandmother not spoken of in history. They were a part of development of commerce in East Africa besides raising families in the remote corners of the tropics. My interest is in the Bais who carried the most important African aesthetic material i.e. beads. Hence, I have been researching on stories of Bead Bais. Many Asian African families sold beads as they established stores inland. 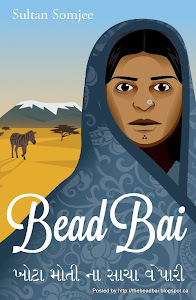 Bead Bai is a story of one woman but is based on stories of many grandmothers and great grandmothers who lived at the time. Thanks for remembering the mothers who nurtured at least two generations in East Africa and who as you say `persevered in a men's world` .